This was super fun! I kinda love the idea of designing my own paths and board placements from scratch. Especially as later I can even get artistic with it and try to draw images using the paths… but that’s a little deep down the rabbit hole. For now I’m content with getting all three of these together with only one Via. The last one was pretty complex and I couldn’t find a way to reroute it. Luckily one simple via is quite fine and easy to wrap my head around. Also, I did quite like making the paths curvy in the last one. 1_attiny85_jig - I didn’t resize this board so it looks a bit big with a lot of empty space surrounding the components, made a mental note to do the next design smaller. 2_attiny85_LED - For some reason wanted to do a vertical design, not sure why. This was a little smaller, but the routes are kind of crazy… made a mental note here to have cleaner more sensible routes for the final design schematic. 3_attiny85_transistor - The piece with the Via. And the curvy routes. The really S shaped route tool is a bit hard to control without clicking a lot, so I found myself switching back and forth between downward shaped S and upward shaped S curves. Sometimes it resulted in weird clunky areas I guess I forgot to resolve, as in the far left spot. 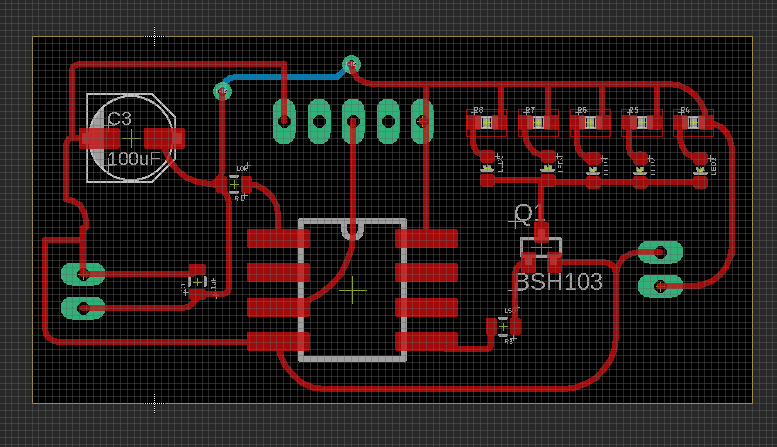 Otherwise though, I like how this board turned out the most of all, especially as it was the most complicated and took some time thinking about specific pieces, as well as continually referencing the electrical schematic. Got this tiny lil thing soldered together and got a light blinking, not sure why it's blinking at 1/10th time... did the beep test and nothing was short circuited. So small! I also think I did the wrong thing and soldered the ATtiny direct to the board.